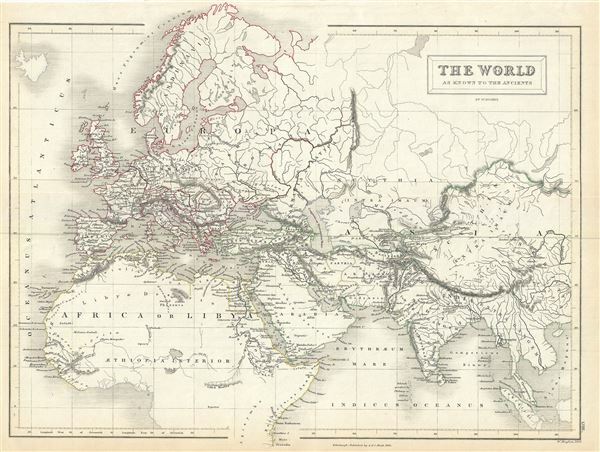 This is a fine example of Adam and Charles Black's 1844 map of the world of the Roman Empire. The map covers the span of world as known to the ancient Romans, from the Scandinavia south, as far as Sumatra. Includes all of Europe, Arabia, part of Asia including the Indian subcontinent and part of Africa. Throughout, the map identifies various cities, towns, rivers and an assortment of additional topographical details. This map was engraved by W. Hughes and issued as plate no. LVIII in the 1844 edition of Black's General Atlas.